It’s time for another roundup of Akira Kurosawa related news and links that have been circulating online in the past week or so. We have news of a new French Seven Samurai release and Tarantino’s Hateful Eight as well as some French media links. Also, there are some gorgeous pictures on Tumblr. To start off, EastAsia.fr (in French) has reviewed and liked the new Seven Samurai release by Wild Side Films, which is available on both DVD and Blu-ray. In addition to offering a new and enhanced edition of the film for a French speaking audience, the release is important as it is the first time that Catherine Cadou‘s Kurosawa documentary Kurosawa’s Way (Kurosawa, la voie), which was first shown in Cannes in 2011, has been made available on home video. Also in French, a five-minute 1980 video report and interview with Kurosawa has been doing the rounds on social media. 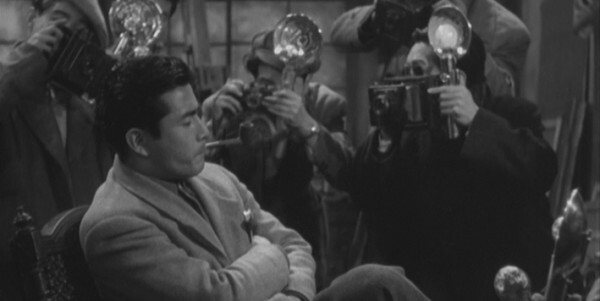 If you follow the link, you can also watch a handful of other archived French video reports on Kurosawa from over the years. Still in French, the French magazine Zasshi‘s January issue is dedicated to the cinema of Akira Kurosawa. The link takes you directly to the digital edition of the magazine. Social media has also been linking to illustrator Tony Stella‘s Tumblr account, which showcases his brilliant Kurosawa designs. Well worth a look! And speaking of Tumblr, another link that has been circulating is flyingson‘s visual comparison of noh masks and the characters that they influenced in Kurosawa’s Throne of Blood. You may have seen the same thing in different forms before, but it’s great to look at. Finally, Variety reports that Quentin Tarantino has started shooting The Hateful Eight, a western which shares some DNA with The Magnificent Seven and by extension also Kurosawa’s Seven Samurai, although not being either a remake or a reimagining of either. I know some of you are very much looking forward to the completed film!